Indeed. 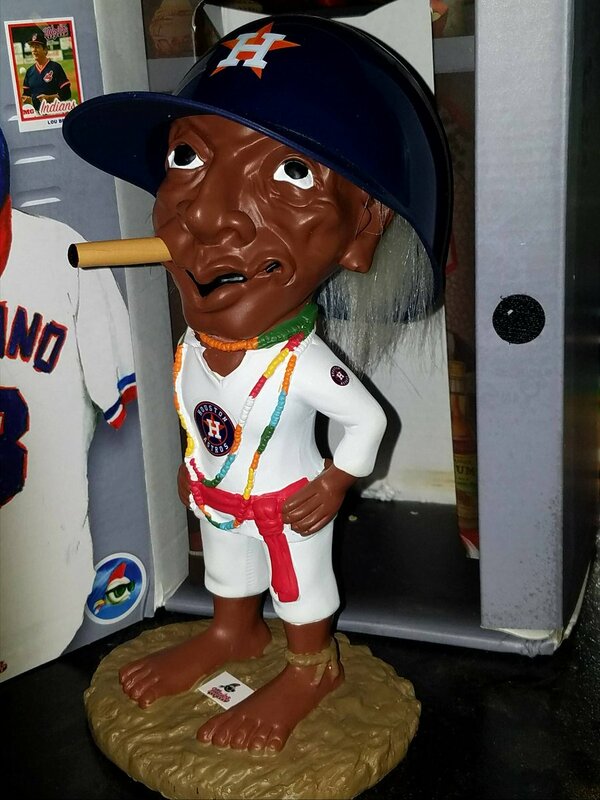 Any team facing the Stros on the road should be scared shitless. Eh, It was the same story last year but it worked out in the play-offs. What is the feeling/mood in the clubhouse after all the injuries and getting swept by the Mariners? Are they panicking a little, or in general, are they confident about their chances to repeat? It feels to me like they are playing tight, but maybe that's because our expectations are so high this year. Sure, the players are disappointed in the recent results, but there's no need to panic. The players still have faith in the team and its chances. The Astros are still in the driver's seat in the AL West and should win the division. You have to remember they have four players on the disabled list who have been on All-Star teams, including the reigning AL MVP Award winner in Jose Altuve and the World Series MVP in George Springer. The Astros went through a rough patch last August and came out of it. That being said, the AL West is much better this year, and objects in Houston's rearview mirror may be closer than they appear. 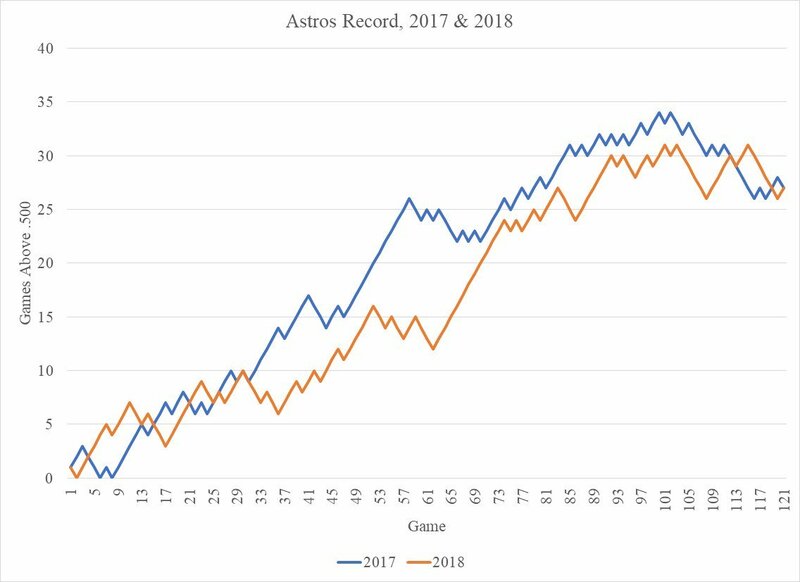 As good as the Astros' offense has been statistically over the past two years, the team has scored fewer runs on a per-game basis at home. This is now Year 2 with the new batter's eye. Has there been any talk within the organization about what it could do to change that setup, whether it's changing the color or something else? Not that I know of, but it wouldn't surprise me if the batter's eye was addressed. It's no secret the players don't like it, and there have been a few subtle changes to it. But you also have to remember, other teams have to hit at Minute Maid Park as well, and the Astros did score 13 runs against the Dodgers in Game 5 of the World Series last year. I think the batter's eye is an issue, but not the only issue. I see where Seattle closer Edwin Diaz practically demanded that manager Scott Servais insert him for the fourth straight game to get the save against the Astros on Sunday. It's apparent that Diaz, Servais and the rest of the Mariners realized the importance and urgency of the game. Astros manager AJ Hinch, on the other hand, doesn't appear to be the least bit concerned. It seems the players are following the lead of their manager. Perhaps Hinch should shake up the batting order to try to manufacture some runs and light a fire under his guys. -- David L., Huntsville, Ala. I wouldn't put too much stock in Hinch's demeanor in the three-minute postgame interviews you see on TV. Trust me, losing bothers him way more than it bothers the fans. What good would throwing a microphone or pushing over a table do? Nothing. Hinch has a psychology degree from Stanford and knows how to handle a room full of alpha males. We don't know what he does behind the scenes, but it's worked. He has a ring, while Servais' teams have underperformed. Plus, I don't know how you expect Hinch to shake up a batting order that doesn't include Altuve and Springer. Like do what, exactly? He only has 12 position players. I'd love to know what "shake up" the batting order means. Hit Alex Bregman ninth? When they get healthy, the Astros' offense will return to form. If I'm a fan, I'd rather have the manager be a calm presence who says, "We'll be fine," than one who sits at the microphone and pouts. Why are the Astros being so sketchy about Altuve's knee? What is the injury, other than "discomfort?" Altuve couldn't even say if he'd had an MRI. I hear you, Malissa. The Astros are very secretive with injuries, so I get the fans' frustration. The reporters share it, too. Maybe it's worse than they're letting on? Maybe they thought it wasn't too bad and it's not healing as quickly as they had hoped? Whatever the case, the longer Altuve is out, the more there is a cause for concern going forward. Do you believe there is room for either Jake Marisnick or Tyler White on a potential playoff roster? And if so, which pitchers would they leave off the roster to make room (if everyone is healthy)? Considering the Astros wouldn't need as many pitchers in the postseason, there's room for perhaps two extra position players. Marisnick, I believe, is a lock when he's healthy, considering the defense he brings. We've seen him make a pair of amazing plays the past couple of weeks. Marisnick would have been on the playoff roster last year had he been healthy. White's got a shot because of his bat. Last year, Houston carried 11 pitchers, three catchers, six infielders and five outfielders in the AL Division Series. It's hard to say at this point which relievers get pushed out. There's some frustration among many fans with how the Astros' young guys and callups are doing. Some of these players have very few games played or at-bats. How long before we have a good idea what type of Major League player a guy is going to be? That's a tough question. I do know it's not fair to judge a player, especially a 21-year-old like Kyle Tucker on his first 100 plate appearances. I'd like to give him a half season of plate appearances (around 300) to get a better idea of where he's at. Even then, it's an inexact science. J.D. Martinez had nearly 1,000 plate appearances with the Astros before he was cut, and he blossomed into a star with the Tigers, D-backs and now the Red Sox. One of the greatest things about the Astros is the positive and brother-like culture in the clubhouse. Bringing in Roberto Osuna, do you think the situation will affect the clubhouse culture and ultimately affect the team on the field? That's a fair question and not one that can be answered just yet. The players have been very diplomatic in their responses. Chemistry is key, but I find it hard to believe any players who aren't in favor of the Osuna acquisition are letting their feelings affect their play. We might not know the answer to this until much later. The Astros are struggling while Altuve, Springer, Lance McCullers Jr. and Chris Devenski are on the DL. That's the biggest issue right now. Considering the offensive struggles the team has had, do you see Houston making a late trade for a bat? Maybe a guy like Josh Donaldson to be the designated hitter? The Justin Verlander trade helped spark the team last year, and maybe a late move could do it again. We've seen some big trades made in August over the years, and the Astros pulled on off last year by landing Verlander, like you said. Trades are harder to make in August because any players who are traded first to have pass through waivers, but Donaldson is a good name to keep an eye on. So is Andrew McCutchen of the Giants. My guess is, if Altuve is out for an extended period of time, Houston may try to add a bat. I’d much rather face the Yankees than the Mariners in the ALCS. marks0223, desihooper and BleedsRocketRed like this. msn and Houstunna like this. 16 games left in the division for the Astros with 3 more games left against Oakland next week and 3 more against Seattle. Houston still has 10 games left with LAA. The series against the A's and Seattle are very important for Houston to win obviously but it's key for Houston not to lay eggs against LAA. Houston still has 23 games against sub .500 teams and the A's have 21 game left against sub .500 teams. Houston will have 12 games against teams above .500 which include Boston and the D-Backs. Oakland has 13 games remaining against teams above .500 which include 3 against Houston, 7 against Seattle, and 3 against the Yankees. A week from Sunday will tell a lot about Oakland heading into the final month in September with Houston and Seattle back to back. Based on the graphics, NYY, Houston, and Oakland has the easiest remaining schedule in all of MLB. Each team obviously will be pushing to win as many games as they can to keep home field advantage in the first round. Houston must keep a better record than Cleveland, while New York and Oakland will be pushing hard to have the wild card game at their respective stadium. Oakland can still win the division but I like Houston's chances to hold the lead in the division if everyone is healthy. New York fans feel very confident that they can beat Boston at Fenway once they get Judge back. desihooper, HTM, marks0223 and 3 others like this. Aaron judge isn’t putting the Yankees over the Red Sox. We need Oakland to cough another game or 2 in Minnesota where the twins are really tough to beat at home. Trout sitting out a few more games wouldn’t hurt our cause either! **** all this. **** this entire post right in the ****ing goatass. "Based on the graphics..." **** that. **** this **** off. **** you. ****. ****. ****. It's not too crazy to think the Yankees could catch Boston. They're up 4-0 right now on Bal and they have the easiest schedule left. If they win tonight, they will be 6 games out. I still think Boston hangs on to win but it's not a given that they have it wrapped up. Who would we rather face in the playoffs? It’s almost certain to be Cleveland if the Stros hang on for the division win. There is an outside shot at the 1 seed. The one seed likely gets NYY or Oak, or possibly Boston. I think all things considered I would rather face any of those teams in a 7 game series rather than 5, where it is much less of a crap shoot. Over 7 games I like the Stros chances against the Yankee or Oakland starters especially. Facing Cleveland in the 5 game series might be the best considering Bauer and Miller are out. I think best case scenario is Cleveland ALDS and Oakland in the ALCS. It doesn't really matter in my opinion. There are no easy options in the AL. Yanks, Indians, Sox and A's all present problems. If we play close to our best, I think the Sox are the only team that can beat us in a 7 game series due to their monster lineup. The big thing is holding onto the Division, because your odds of getting through the field are significantly lower as a Wildcard.